Finding worthwhile apps and games for your smartphone has never been easy especially, when there are more than 1000’s of apps to choose from. So, taking cues from Windows 8 and its Windows Store for apps and games, Microsoft has decided to rename its Windows Phone Marketplace to Windows Phone Store. The two stores will now even share the same Store icon. Changes that will be readily visible when you visit the website, are a cleaner design with new menu options for improved app discovery. Marketplace menu option has changed to Apps & Games. The store displays better sorting options now. You’ll find both, Top Free and Top Paid apps. Besides, a new addition to the lineup—Best Rated—ranks apps has been introduced which on the basis of customer ratings and actual usage patterns informs you what’s hot in the market. The search box too has been improved, it now relies on the Microsoft’s proprietary search engine Bing for supplying results. The box makes it easier to: Finds apps in same genre. For example, simply type ‘health’ to check out apps related to dieting, exercise, and more. Plus, it corrects your spelling mistakes or typos automatically. The addition of Bing’s search engine can be regarded as a part of the infrastructure upgrade. The list of the apps, including the renamed and improved New+Rising is now refreshed more frequently. Also, on public request, a mechanism has been included for reporting apps that concerns you. For instance, if there is any app that does not work as advertised, has some technical fault or you find it offensive, you can report about it to the concerned authorities using a ‘Report concern’ link. The link can be found on the download page of every app. All the apps are thoroughly tested before being accepted. 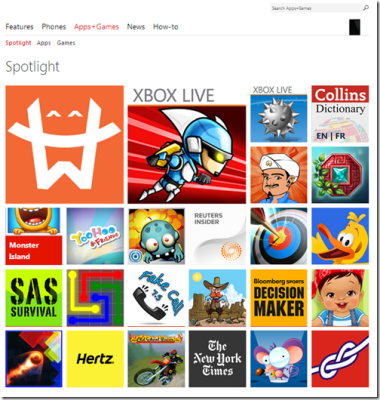 Visit the Online Windows Phone Store today and try out its some new browsing options to find your apps easily.